In Magic Kingdom, this coiled rope Hidden Mickey can be found on the ferry loading docks in the park and at the Transportation and Ticket Center. Also in Magic Kingdom, this Hidden Mickey is part of a window display along Main Street USA’s Confectionery store. This Hidden Mickey can be found in the Morocco Pavilion display in World Showcase, Epcot. A little harder to spot, this Hidden Mickey is located in the Karamell Kuche shop of Epcot’s Germany Pavilion. Try to find others as you make your way through the parks! Share your favorite Hidden Mickey spots on this post to help out other Disney-ers. This iconic supernatural journey through a ghostly home is located in Liberty Square, Magic Kingdom, and is one of Disney World’s most famous attractions. Just because it’s well-known doesn’t mean it’s overrated! The ambiance and attention to detail are just a few great things that puts this ride on my must list. 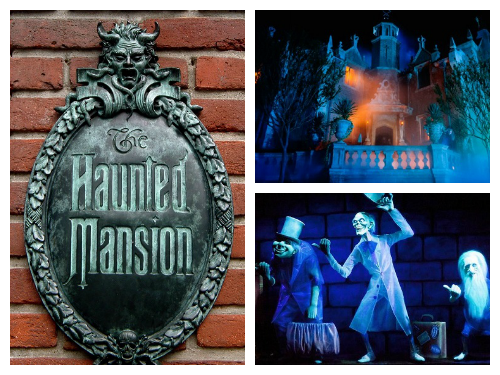 The Haunted Mansion attraction starts with an interactive queue that builds the spooky atmosphere, complete with an eerie crypt and ghostly graveyard. Inside the mansion, Disney Imagineers put forth some of their greatest work with a room that inexplicably stretches right before your eyes. When you get to the ride, an invisible Ghost Host invites you to take a seat inside your ‘doom buggy’ and tour the home where ghosts lurk at every turn! You’ll want to try out this ride a couple times to catch all the details – they’re worth it! While a little scary at times, this ride is suitable for younger vacationers, and is perfect for the kid at heart. It truly sums up Disney Magic. Images courtesy of vimeo.com, answerparty.com, and disneyworld.disney.go.com. For an enjoyable and laid-back evening, stop by Disney’s Boardwalk, located just outside of Epcot and across from the Yacht and Beach Club hotels. Though it’s open during the morning and afternoon, the best time to experience the Boardwalk is at night, when the entire strip is lit up and comes to life. The environment is evocative of a classic Seaside boardwalk, complete with arcades, bakeries, shops, and live performers. If you walk along the strip, win some prizes by playing games of chance and skill, and end your evening by picking a table along the water’s edge and treating yourself to a beautiful view of Epcot’s IllumiNations, visible just above the Boardwalk buildings. I personally love ending my vacations with a trip to the Boardwalk, which is somehow simultaneously relaxing and exciting. There are many great places to eat (the ice cream shop is particularly delicious) and the performers are so full of life. The Boardwalk is a must for me, and it’s something unique that everyone should experience at least once! One of the biggest benefits of staying on Disney property is access to “Extra Magic Hours,” which is exactly what it sounds like – more time to enjoy the parks! Everyday, one of the four main parks are open an hour before or after the regular schedule. This means that if Magic Kingdom had Extra Magic Hours tomorrow morning, the park would be open to on-site Disney vacationers at 8 AM instead of 9 AM! Evening Extra Magic Hours tend to run even longer, tacking on two or three hours after closing time. If you’re staying at one of the Disney-owned hotels, I would highly recommend planning some days around the announced Extra Magic Hours. Before you decide on a park for the day, be sure to check out Disney’s schedule and see if your group can work in the designated times. Parks during Extra Magic Hours are often much less crowded, and it’s a unique experience to see them early in the morning and late at night! When factoring in these Extra Magic Hours, you should also read up on what is open and running during these times. Image courtesy of disneylandflorida.com, resources courtesy of disneyworld.disney.go.com and allears.net.